Remember blight, an important justification for eminent domain? As I've written, the colloquial definition of blight—"when the fabric of a community is shot to hell"—offered by academic Lynne Sagalyn sounded more like the 1970s South Bronx than early 2000s Prospect Heights, where cracked sidewalks, weeds, and too-petite properties (like the small house on Dean Street in the photo at right) were seen as indicia of blight. But the Atlantic Yards site, despite many signs of gentrification within it and nearby, was nonetheless designated as blighted, thanks to New York State's loose definition ("a substandard or insanitary area, or is in danger of becoming” one), a government agency bent on condemnation, and a legal system unwilling to look too closely. For leasing development rights to three Pacific Park parcels to two developers, Greenland Forest City Partners--owned 95% by Greenland USA--will get nearly $199 million, records suggest. That's nearly the same amount that Greenland USA's parent Greenland Group paid in 2014 to enter the project. Forest City Enterprises. Forest City announced 12/20/13, "Under the terms of the definitive agreement, Greenland Group will make a capital contribution at closing of approximately $200 million to acquire a 70 percent equity interest in the project, excluding Barclays Center [operating company] and B2, the first residential building [aka 461 Dean]." Now that payment also came with significant infrastructure obligations, such as the new railyard, the deck, and the public open space. But the contrast suggests--at least in broad strokes--that Forest City was operating from weakness; indeed, it announced a $242.4 million impairment on the deal. Um, there's an election for Public Advocate today, with a giant field. Some candidates have real estate cash, according to the Real Deal, but some figures are pretty modest. Here's the Brooklyn Eagle's guide of guides. But the most important change may simply be the arrival of an elevator. But here's the interesting part of the renovation, which began after the club closed down in August 2017 and after the independent club was bought "by BSE Global, the parent company of Barclays Center, and the Bowery Presents, which is partly owned by the concert giant AEG, for a price estimated at about $35 million." Downtown Brooklyn, recognizing open space deficits (and more), looks to "public realm action plan"
Today, Downtown Brooklyn Partnership announced the selection of a joint proposal from design firms WXY Studio (WXY) and Bjarke Ingels Group (BIG Architects) to conduct a comprehensive study and implementation plan for Downtown Brooklyn’s public realm. The plan will help advance Downtown Brooklyn as a competitive, national urban center. 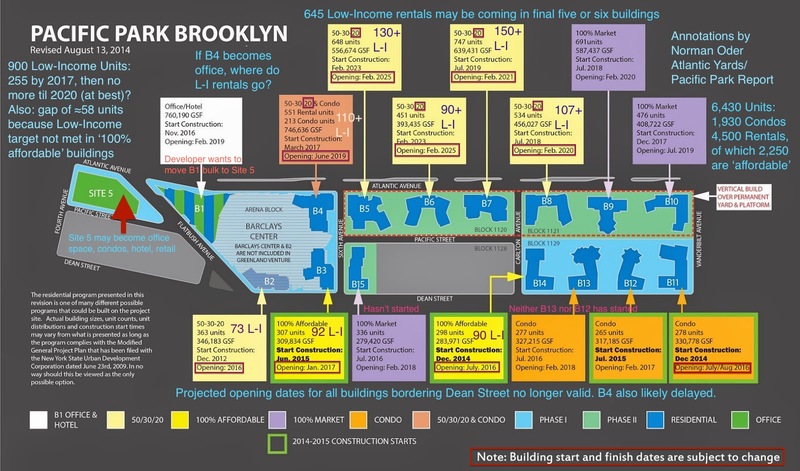 Downtown Brooklyn has faced unprecedented growth over the last fifteen years since the 2004 rezoning. Since then, the neighborhood has transformed into a true 24-hour mixed-use community, and with that have come new demands on streets, sidewalks, transit infrastructure and public spaces. Post columnist: arena built "over the train yard" has led to "malls, businesses, restaurants and people living more interesting lives"
Was the Queens headquarters for Amazon a good idea? You are damned right it was. This situation reminds me of when developers wanted to build a basketball arena in Brooklyn. The builders were proposing that they put a platform over a big open space where commuter trains were parked when they weren’t needed during the day. They’d build the arena — now called Barclays Center — over the train yard, and the whole neighborhood, they suggested, would come alive. Ah, this is another version of "Atlantic Yards down the memory hole." The arena was not to be built "over the train yard." No platform had to be built. From the Real Deal yesterday, Third time’s a charm? Greenland taps Polaris Pacific to replace the Agency at Metropolis. Yes, Greenland USA is now using its third brokerage--after Douglas Elliman and the Agency--to sell condos at the $1 billion, three tower Metropolis condo project, of which the first two towers are done. It's not a small lift, given that Tower III has 736 of 1,500 total units and a reported 80% of 308-unit Tower I has been sold and there are no figures public on Tower II. Belmont Park arena project to be delayed, reported Long Island Business News yesterday, and while the Final Environmental Impact Statement and thus construction start have been delayed past the once-projected spring date, that doesn't necessarily mean the arena can't open in 2021. But it does raise question marks. As noted in the article, the board of Empire State Development voted yesterday to extend the contract of AKRF, the authority's go-to environmental consultant, for one year, through September 2020. That reflects more extensive comments than typical, with the need to respond to them, as well as other factors, as noted below. According to ESD Board Materials (p. 325 ff. ), the original two-year contract term was extended, and the original contract amount, not to exceed $2 million, was amended with a $950,000 fee and a $300,000 contingency. The developer, which includes the New York Islanders and partners, funds the environmental review.